This one is a head scratcher – if you look at the clutch on your Arctic Cat, have you noticed how the cover bushing barely captures the end of the main shaft of the primary clutch? The bolt that holds the primary clutch to the crankshaft is recessed Arctic Cat Primary Clutch cover down into the primary – we assume this is for clearance on the new sleds with their tight body panels. But this leaves the clutch cover and its bushing with very little contact and support on the main shaft!!! The bushing isn’t very tall inside the clutch cover. Now consider that there is a full 0.40″ of bushing that is unsupported (that’s almost a half inch!) and you start to realize where we’re going with this. There’s only about 0.10″ of bushing support to begin with! It is right at engagement with the belt that the cover needs the most support to keep it from cocking and binding. Sure, there is another bushing down at the bottom in the movable sheave, but that’s at the bottom. The top is left with little support. This might work fine with a new bushing, but as it wears the support is going to do nothing but head south. Maybe this explains why it is so common to find worn bushings on the rollers and flyweights? Now when we add big power engines, things like 150-160 HP 800 twins, 1000 cc twin’s, and 1100cc Turbo-charged four-strokes the need for as much support and alignment becomes even more critical. It shouldn’t take a rocket scientist to realize the benefit from adding support to this area. That’s where Thunder Products comes in. They have developed a knack over the years for identifying bolt-on solutions to fix or improve upon mass-produced parts on our snowmobiles. Like we stated above, it is most likely this way from the factory because of how tight the “skinny mini” Firecat was in this area, and the new sleds continue to be really tight for clearance here.Arctic Cat Primary Clutch with ABC kit installed. Here’s the fix; the ABC kit (Additional Bearing Contact). 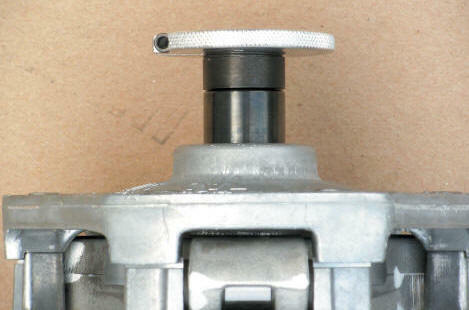 It consists of a “bearing extension” insert (that extends the primary main shaft to fully support the cover bushing), a longer clutch bolt, and while we’re at it you get a threaded sheave adjuster on the end of the extension so you can set the movable sheave position (and drive belt side clearance) without having to take apart the clutch! Even if you discount the bushing support argument, you know full well how much you need an external side clearance adjuster! Installation is stupid easy. Remove the stock clutch bolt. Install the ABC shaft extension. Install and torque the new clutch bolt. If equipped, loosen the locking set screw on the adjuster, set the adjuster for the proper belt side clearance, tighten the locking set screw, go ride. Every Arctic Cat Mountain sled needs this, period. Every 800, 1000, 1100 needs this, period. 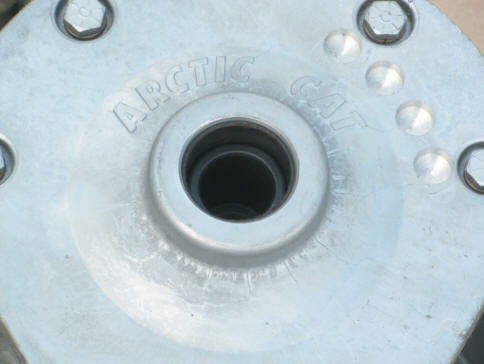 All Arctic Cats will experience longer clutch component life through better movable to fixed sheave alignment and smoother shifting. You will get more life out of your drive belts. Instead of having to take apart the clutch and deal with spacing shims (and run the risk of wrecking the clutch during disassembly due to all of the Red Loctite in there) you can adjust the sheaves with the external adjuster. If you ride an Arctic Cat, you know why you should have this on your sled. Arctic Cat ABC (Additional Bearing Contact) kit. The quality of the kit’s components are well designed, no cheap parts here. The longer clutch bolt is high-grade alloy steel. The bearing extension is melonited for lubricity and hardness. The whole kit adds only 0.30″ to the overall clutch width, as most of it fits down inside the cover bushing.